▶Color：Wood Color / Green / Yellow / White / Blue. ▶Wood structure Process: Smoked / carbonized. 【Package contents】: 1 × Flower Stand. ▶Decorative: a lovely way to display your flowers - colourful buds, green plants, herbs, vases, etc. Will all look spectacular. 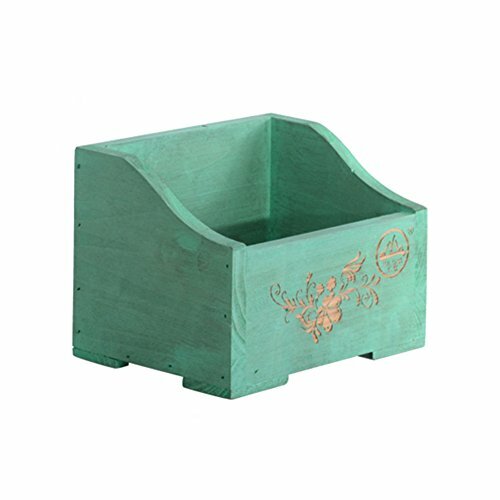 ▶Suitable for conservatories, balconies or small yards, this planter stand offers a sturdy and durable platform for flowers, foliage, herbs, spices and succulents alike. ★ Please place the product on a sturdy surface to increase loading capacity. ★ This product has only one rack , other decorations only provide effects, not included, hope to understand. 【Three sizes available】：15×12×12cm , 25×11×12cm , 30×14×15cm. 【Material】: Chinese fir. High temperature carbonization, strong texture, anti-corrosion. 【Can be hung】: There is a wall-mounted design on the rear side of the flower stand. Not only can it be placed on the table, but it can also be hung on the wall without taking up space. 【Carving craft】: The original simple flower stand adds to the carved design, making the flower stand simple but not monotonous. Add a touch of fun to your desktop. 【Delivery time】: 10-15 working days. Return period 30 days. Direct sales by manufacturers. If you have any questions about this product by LXLA-Flower Stand, contact us by completing and submitting the form below. If you are looking for a specif part number, please include it with your message.